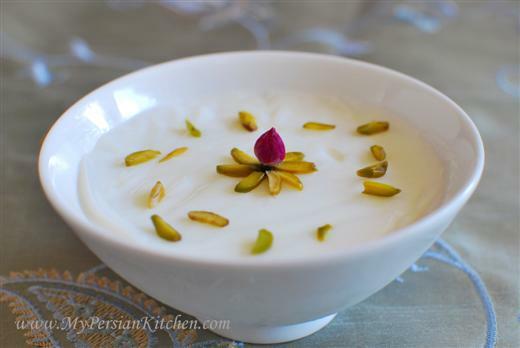 I think it’s only fair for me to post the recipe for one of my most favorite Persian desserts while here in Maui, known as paradise, and on the first day of Summer. Yakh Dar Behesht literally translates into ice in paradise and it’s generally a dessert that is made in the summer time. This dessert definitely has a very delicate taste and I can’t get enough of it. 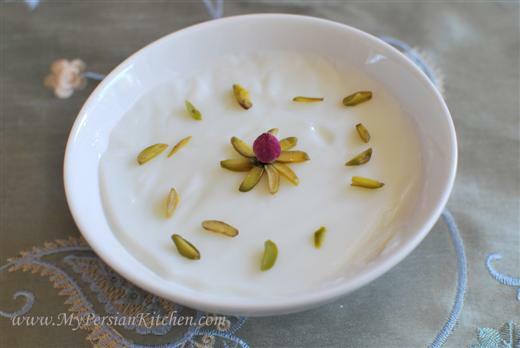 I fell in love with this dessert the very first time I ever had it when my grandma made it one hot summer day in Tehran. To this day I think her recipe is the very best one I have ever had. I am so excited to share it with you today! This is a very easy dessert to make. All you need is the above ingredients and a little patience! I have found that the best option for this dessert is to use Wheat Starch or Neshasteh Ghandom. Don’t mistakenly get Rice Starch or Rice Flour like I have done in the past mistakenly. They are the same color but very different! 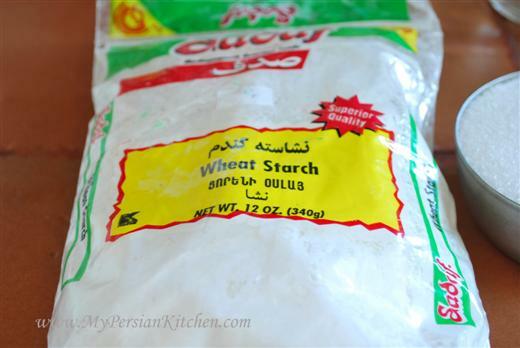 Dilute wheat starch in water. Add milk and place on the burner. Cook on medium low while stirring constantly until you get a thick consistency. 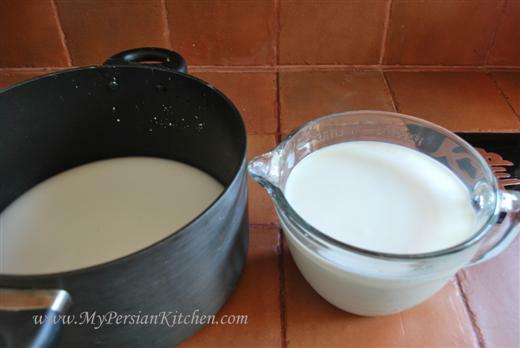 This step is similar to making custard, you want to make sure that the milk doesn’t stick to the bottom and you have to keep an eye on it. Once the mixture has begun to thicken add sugar and rose water. I like rose water a lot so if you love it as much as I do, add 1/2 cup, but if you want it on the mild side, then only add 1/4 of a cup. Continue stirring for another few minutes until the added ingredients are well incorporated. Once done, you can either pour the mixture in individual dessert bowls or in a large plate of your choice that has low edges. Let cool at room temperature. Refrigerate for at least 4 hours prior to serving. 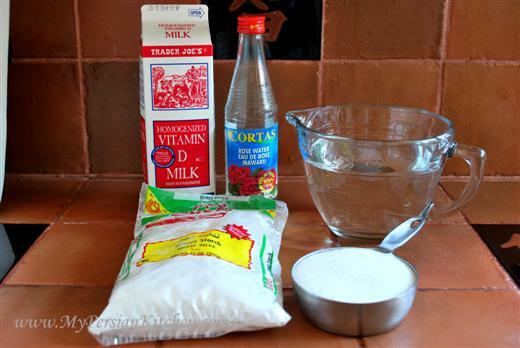 Dilute wheat starch in water. Add milk and place on the burner. Cook on medium low while stirring constantly until you get a thick consistency. This step is similar to making custard you want to make sure that the milk doesn’t stick to the bottom and you have to keep an eye on it. Once the custard has begun to thicken add sugar and rose water. Continue stirring for another few minutes until the added ingredients are well incorporated. Not sure if I can get wheat starch here. Do you think cornstarch or potato starch would work? ap269, I think that corn starch can work but not sure…I would have to try it out when I get back home. I am so glad to have the recipe now! I know it is authentic but the minimalist garnish is very chic! Lori Lynn, thank you!! Let me know if you make it! This dish sounds amazing. I am so used to using just a small portion of rose water, any measurement involving a cup sounds like a lot, but it just sounds like an incredible treat. Sanam, this looks divine. Are those pistacios slivered on top of your white custard work of art? Yes, Marilyn! it gives it all a nice crunch! My husband (from Iran) is borderline diabetic–do you think Splenda would work, have you ever tried it in place of sugar? Verna, I haven’t tried it with anything else but sugar. Give it a try and see how it comes out!! SALAM AZIZAM THIS IS NOT YAKH DAR BEHESHT THIS IS FERENI!! !